A series of short biographical sketches of polar exploration personalities . . .
American journalist and polar airship pioneer, Walter Wellman, led a total of five attempts to reach the North Pole: two by surface expeditions and three by air. Although Wellman's well-publicized aerial attempts were unsuccessful, the world-wide attention these flights generated opened up the possibility that the vast polar regions could best be explored by air. The larger 1909 hangar being built in 1908 at Camp Wellman, Virgo Bay. 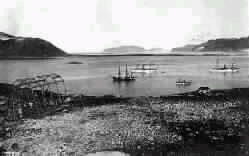 Camp Wellman, Virgo Bay, Danes Island, Spitsbergen, showing the 1906-07 hangar under construction. Camp Wellman in 1910, from a photo taken by the Zeppelin expedition to Spitsbergen when the group visited Danes Island. Walter Wellman was born in Mentor, Ohio in 1858. In 1879, at the age of 21, Wellman founded a newspaper, the Cincinnati Evening Post. In 1884, Wellman became the Washington correspondent and political reporter for the Chicago Herald and its successor, the Record-Herald. He remained as a Washington correspondent until 1911. Wellman's abiding passion was exploration, and during the Washington years he found the time and resources to carry out five expeditions toward the North Pole, three of them by airship; an expedition to Watling Island (San Salvador) in the Bahamas to locate the first landfall of Columbus; and, in 1910, an aborted airship flight across the Atlantic Ocean. The Surface Attempts at the Pole. In 1893, at age 35, Wellman traveled to Norway in an attempt to learn about ice conditions around the archipelago of Spitsbergen (now Svalbard) and, in the process, a short cut to the North Pole. 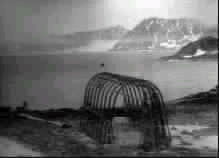 In the spring of 1894, Wellman sailed for Spitsbergen on a Norwegian ice-steamer, the Ragnvald Jarl, and in early May pitched camp on the shores of Virgo Harbor, Danes Island (Dansk�ya), a locale that later figured prominently in the history of polar aviation. On May 10, Wellman sailed north and east on the Jarl and arrived at the Seven Islands. After leaving the Ragnvald Jarl and taking to sledges and aluminum boats, Wellman's party had scarcely progressed north when a courier overtook them and reported that ice had holed the Jarl along the western short of tiny Walden Island. After sending the Ragnvald Jarl's crew south in search of rescue, Wellman again started north. But by this time the summer sun had warmed the pack ice into a wet mass of shifting slush. With his sledges useless, Wellman had his sledge dogs needlessly shot. He was now stuck on a melting and splintering ice pack with no prospect save man-hauling the boats back to Walden Island. Exhausted and freezing, with their clothes and equipment soaked by slush and falls into open leads of sub-freezing water, Wellman's men staggered back to Walden. This experience led Wellman to his first consideration of the use of some method of aerial exploration in the Arctic. "...[P]ushing and pulling the heavy sledges and boats over the rough ice on this expedition," Wellman later wrote, "the idea first came to me of using an aerial craft in Arctic exploration. Often I looked up into the air and wished we had some means of traveling that royal road where there were no ice hummocks, no leads of open water, no obstacles to rapid progress." The North Pole by Air. In 1906, Wellman had raised the necessary funds to have an airship built in Paris and a large airship hangar and expedition base camp constructed at Virgo Harbor. But the hangar was not completed until August and when the airship's engines were tested, they promptly self-destructed. Wellman returned to Virgo Harbor in the summer of 1907 with an airship configured by early airship builder Melvin Vaniman. August 1907 came and went and still the airship remained tethered in her shed, the result of high winds. The wind did not abate until early September at which time Wellman ordered a short trial flight of fifteen miles. This was the first time a motorized airship had flown in the Arctic. Wellman tried for the pole one last time in the summer of 1909. About 60 miles north of the hangar at Virgo Harbor, the trailing ballast line, a construction that Wellman called an "equilabrator," fell off. The disaster caused Wellman to turn the airship around and receive a rescue tow from a nearby Norwegian survey ship. The Atlantic Flight. In the fall of 1910, Wellman on board a new dirigible left the east coast of the United States and drifted in a huge arc past Cape Cod and then southeast for over 1,000 miles--a far greater distance than that from Virgo Harbor to the Pole--before engine trouble forced the journalist and his crew to abandon ship not far from Bermuda. Wellman brought the ship down within a mile of a passing steamer which delivered Wellman and his crew to shore. The Atlantic adventure set a record for the longest airship flight to date in aviation history. The failure of the 1910 Atlantic flight marked the end of Wellman's aerial career. He lived on until 1934, but never again left the surface of the earth. Although Wellman's well-publicized aerial attempts to reach the north pole were unsuccessful, the world-wide attention these flights generated opened up the possibility that the vast polar regions could best be explored by air. In 1910, just one year after Wellman's last Danes Island flight, a group led by Germany's Count Zeppelin made a trip to Spitsbergen to study the possibility of using Zeppelin airships in polar exploration. However, it was not until 1926 that the Amundsen-Ellsworth-Nobile expedition in the airship Norge finally reached the North Pole by air. About the Author: P. J. Capelotti, Ph.D. is a lecturer in Anthropology and American Studies at Penn State University Abington College. He lives in Abington, Pennsylvania in the US and is the author of numerous books and articles, many of which deal with the North Polar Regions. His recent book, By Airship to the North Pole, is about the Wellman polar airship expeditions from Virgo Bay, Danes Island, Svalbard. Suggestions for further reading . . .
Barr, Susan, ed., 1995. Franz Josef Land. Oslo: Norsk Polarinstitut. Capelotti, P. J., ed. 2000. The Svalbard Archipelago: American military and political geographies of Spitsbergen and other Norwegian polar territories, 1941-1950. Jefferson, NC: McFarland Publishers. Capelotti, P. J. 1999. By Airship to the North Pole: an archaeology of human exploration. New Brunswick, NJ: Rutgers University Press. Capelotti, P. J. The Wellman Polar Airship Expeditions at Virgohamna, Dansk�ya, Svalbard: a study in aerospace archaeology. Oslo: Norwegian Polar Institute, Meddelelser Nr. 145. Mabley, Edward H. 1969. The Motor Balloon "America." Brattleboro, VT: The Stephen Greene Press. Toland, John. 1972. The Great Dirigibles. New York: Dover. Wellman, Walter. 1911. The Aerial Age. New York: A. R. Keller. Two recent books by P. J. Capelotti that you might enjoy . . .
For reviews and additional information, click on the cover image. For a biographical sketch of polar pioneer Louise Boyd, leader of a 1928 search for Roald Amundsen who disappeared on a flight from Tromso to Spitsbergen, click here. For Svalbard and North Polar Regions maps, click here.